It's all in the Pixels: high-resolution remote-sensing data and the mapping and analysis of the archaeological and historical landscape. Meylemens et al. Internet Archaeol. 43. Over the last couple of decades the growth in both the quantity and quality of space- and airborne remote-sensing data has contributed vastly and on an international scale to archaeological prospection and landscape modelling, including novel approaches such as lidar, and multi- and hyperspectral imaging (see, for example, Wiseman and El-Baz 2007). These data are, moreover, becoming increasingly available and ready to use and manipulate through archiving and dissemination of sources via the Internet, and the vast improvement and widespread use of (free) GIS and 3D modelling software. This is also the case in Flanders (Belgium). 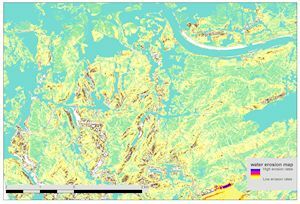 In 2004 a first version of the 'Digital Terrain Model Flanders' became available, a lidar scan covering the whole of Flanders (De Man et al. 2005). In 2014-15 a new DTM version was launched, with a vastly higher resolution. Both DTMs have become a standard source in archaeological practice, and have resulted in the discovery of a multitude of archaeological sites and structures. However, these practices are mostly confined to the 'basic' use of visualisation techniques. The full potential of these and other remote-sensing sources, combined with other data, has only been exploited in a piecemeal fashion. In this contribution we first present an overview of these data and a selection of their uses and merits in archaeological practice in Flanders. We then briefly explore their further potential for use in (landscape) archaeological research and heritage management. Finally, we describe the current practice and future prospects for archiving and dissemination. 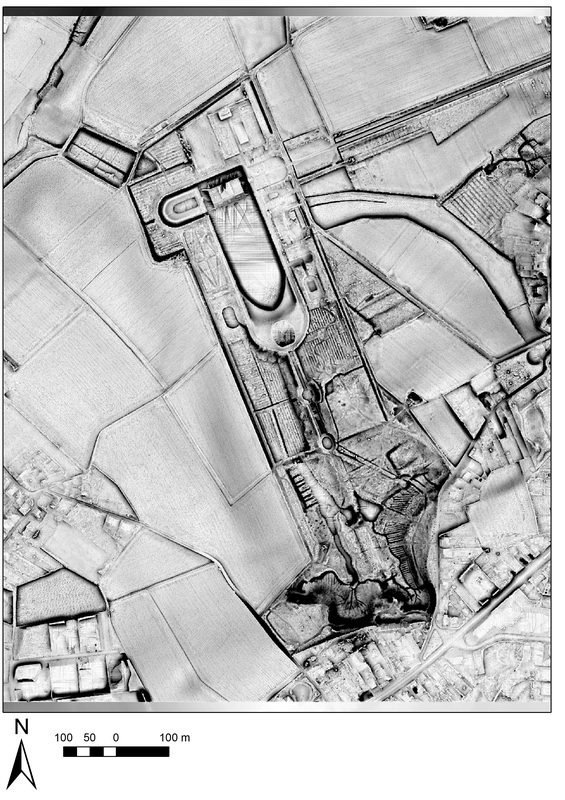 The first systematic use of remote-sensing data in Flemish archaeology dates back to the 1950s and 1960s, with the use of existing aerial photographs from the Public Works Ministry for mapping Roman road and field systems (Mertens 1957), and in the 1970s and 1980s for mapping Celtic Field systems (Van Impe 1977; Vandekerchove 1996). From the end of the 1950s onwards, flights for the purpose of archaeological survey were being conducted by Léva (1990), resulting in c.13,000 photographs in Flanders, only a small number of which have been studied. From the early 1980s onwards a similar practice was undertaken by the University of Ghent and its pilot, J. Semey, resulting in a collection of c.73,000 images, mostly from the western part of Flanders (Bourgeois et al. 2005). This collection too has only been partially processed and studied. 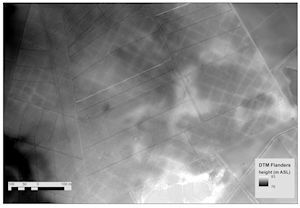 A recent pilot study, which analysed this dataset in combination with other aerial photographs and lidar data for a test area, resulted in a large number and variety of archaeological remains being identified (Stichelbaut et al. 2015; Figure 1), and the discovery of c.190 previously unknown archaeological sites. Earlier thematic studies of this dataset showed its advantages for, among others, the mapping of bronze age barrows and rectangular enclosure sites (Bourgeois and Nenquin 1996), and linear traces (Wiedeman et al. 2005). Prompted by the presence of memorials of World Wars I and II, a number of recent projects also focused on digitising aerial photographs of contemporary military collections (Stichelbaut 2005). Over the last couple of decades a number of new remote-sensing sources have become available, such as lidar and multi- and hyperspectral images. Lidar has been in the forefront of contributing to the detection of archaeological structures. 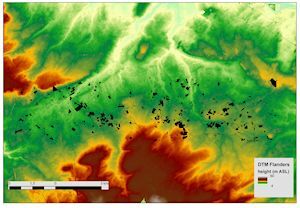 In 2004 the first generation Digital Terrain Model of Flanders became available. This DTM has a mean resolution of 1 scanning point per 4m² (De Man et al. 2005). From 2014 the new generation DTM Flanders became available, with a mean resolution of 16 scanning points per 1m². The use of both DTMs for archaeological survey has become common practice in Flemish archaeology and landscape research. Primarily in historically 'stable' environments, such as old forests, use of DTMs has resulted in the discovery of a large number of previously unknown sites. Spectacular examples are the large number and size of areas with so called 'Celtic Fields' on the sandy soils of the Campine area (Creemers et al. 2011; Meylemans et al. 2015; Figure 2), the huge quantity of charcoal kilns and the extent of iron ore extraction areas in the Zoniën forest near Brussels, and the discovery of a number of previously unknown burial mounds (Figure 3). Besides archaeological sites and structures, more recent elements with cultural/historical value, such as the layout of historical castle gardens and parks, appear sharply defined (Figure 4). In some cases intensely exploited and structured landscapes appear, as in the Meerdaal forest near the city of Leuven, where spectacular erosion gullies and loam extraction pits from the Roman period indicate that this forest is not the 'pristine' forest it was previously believed to be (De Bie and Adriaenssens 2009). As a final example we mention the large number of visible trenches and other structures from both World Wars I and II (Stichelbaut 2005; Stichelbaut et al. 2015). Apart from mapping archaeological structures and sites, lidar is also a valuable resource for geomorphological characterisation. 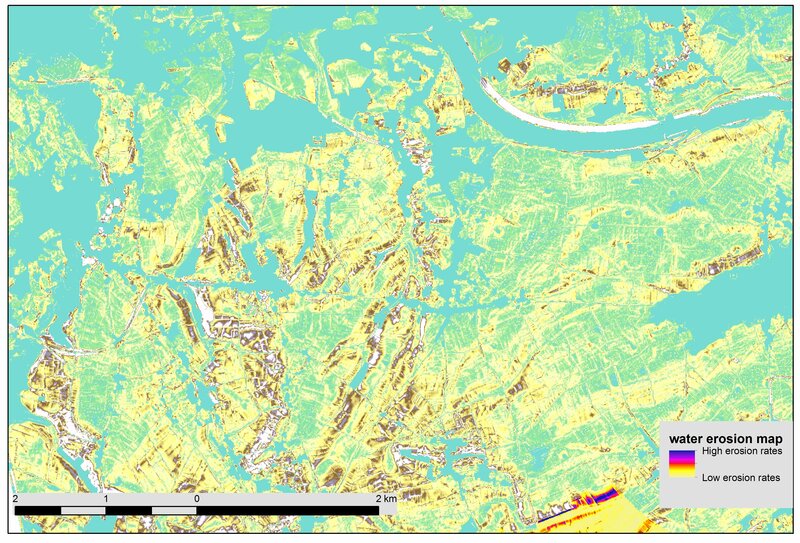 In the broad river valleys of the Scheldt basin, for example, it can be used to detect fossil channels and the 'ridge and swale' topography of point bar deposits (Figure 5). Another example concerns the mapping of dune morphology, and the unravelling of dune formation histories and how they relate to prehistoric occupation (Vanmontfort et al. 2010). The high resolution of the lidar data, sometimes in combination with other sources, also allows the construction of derived models, which can have their merits for archaeological purposes. An obvious example is erosion modelling. Tillage and water erosion models, using the lidar data combined with soil and land-use maps, have been constructed for the whole of Flanders, showing the vast impact of agriculture in the Hesbaye loam region (Figure 6; Notebaert et al. 2006) amongst other things. On a more detailed level these erosion models, combined for example with flow accumulation modelling and the mapping of erosion patterns visible on recent aerial photographs, can provide accurate insights on the impact of erosion on the preservation of archaeological sites and monuments, as was demonstrated by the middle Neolithic causewayed enclosure site of Ottenburg and the Roman earthwork aqueduct of Tongeren (Meylemans 2009; Vanmontfort et al. 2006). A test project in 2008 demonstrated the possibilities of modelling a large number of lidar-derived landscape parameters, combined with other data (for example soil maps) for analysing patterns in the location of Mesolithic and Neolithic sites and finds (Finke et al. 2008). The free availability of both the lidar data (cf. infra) and software such as LAStools and Grass-GIS allows for a wide range of possibilities for 3D modelling and visualisation. However, in archaeological practice in Flanders this is as yet only being used on a piecemeal scale. The bulk of remote-sensing data, including a wide range of aerial photographs, as well as the lidar data, is being stored centrally by the 'GIS-Flanders Agency' (agentschap GIS-Vlaanderen), and is available free to download and use through several services (e.g. https://www.agiv.be/producten/beeldverwerkingsketen). With regard to the lidar data, this includes several derived terrain (dtm) and surface (dsm) model raster files, as well as the point cloud data (in .LAZ format). A large number of multispectral recordings are also freely available, both as processed orthofoto mosaics, as well as the raw data (e.g. https://remotesensing.agiv.be/index.html). In line with these services, a central facility is being built to store and disseminate historical and archaeological aerial photographs and other specific remote-sensing data (Stichelbaut et al. 2015). This application will be available from 2017 onwards, and will from the start host images from a number of collections, including archaeological photographs from Ghent University as well as images from World War I. At the moment the included data are, however, only the 'tip of the iceberg' (Figure 1), of the available datasets. Through the recent application of the 'Code of Good Practice', the quality standard for archaeological preventive (rescue) research in Flanders, the use of airborne remote-sensing sources such as a number of aerial photographs, as well as the lidar scans of the DTM Flanders, has become mandatory in the first phase of such archaeology projects. Furthermore the lidar data is being intensively used to screen primarily forested landscapes, resulting in the detection of a large number of previously unknown sites, which are recorded in the 'Central Archaeological Inventory'. A number of these newly detected sites are being evaluated with a view to their scheduling as protected archaeological sites, including Celtic Field and barrow complexes and a possible Iron Age hillfort. This has resulted in a new line of dialogue between heritage and nature management, as these sites are almost all situated in nature reserve areas. The main challenge here is to synchronise a number of nature management practices with the preservation of these monuments. Besides these rather straightforward approaches, and as earlier test projects have already shown (see above), the bulk of available remote-sensing data offers largely unexploited possibilities for the mapping and characterisation of the physical, archaeological and cultural historical landscape. A possible approach, constructing highly detailed geomorphological maps and using, for example, erosion modelling, could be the construction of maps showing the 'preservation potential' of the landscape for sites and structures from different periods (e.g. Meylemans et al. 2006). 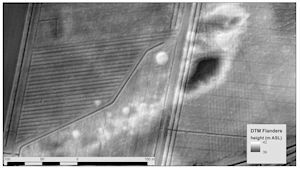 Archaeological practice in Flanders has a long tradition of using remote-sensing data to map archaeological sites and structures. The enormous amount of archaeological and historical photographs has already resulted in the detection of several thousands of archaeological sites and traces, for example barrows, ancient roads, etc. 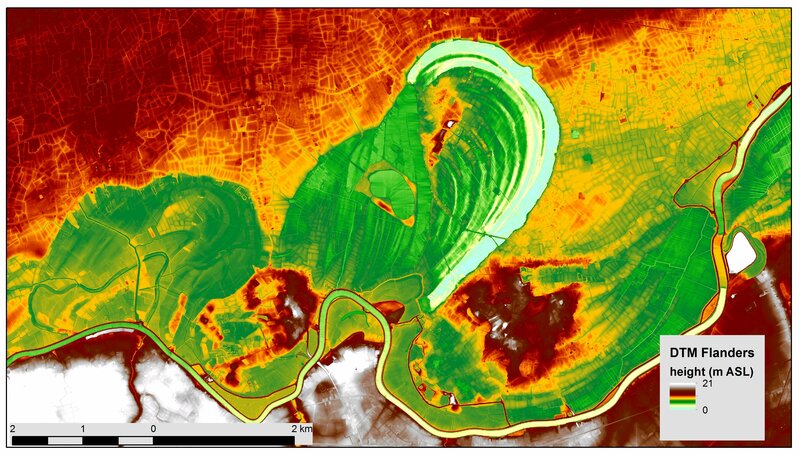 The recent availability of high-resolution remote-sensing data, primarily lidar, has equally resulted in the detection of a large number of sites and structures. This results in new challenges and opportunities for archaeological research and heritage management. Firstly and obviously, it automatically directs archaeological practice to the scale of landscapes. 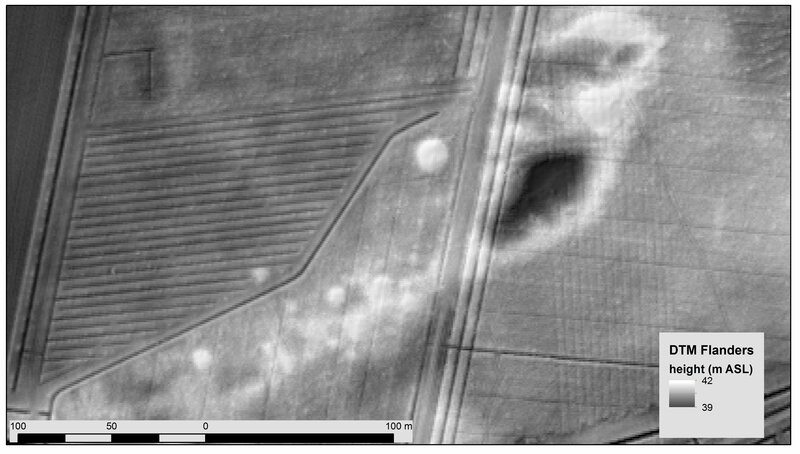 For example, the detection of vast stretches of Celtic Field and associated barrow complexes shows a structured prehistoric cultural landscape, providing a new framework for the interpretation of older archaeological data. Secondly, on a management level, since these sites are mainly situated in nature reserve areas, it necessitates a synchronisation of nature management practices with the preservation of these archaeological structures. The potential of these sources has, however, not yet been fully exploited. At the moment there is a large backlog in the documentation and dissemination of older remote-sensing data. Furthermore, although the new products and especially the lidar data are being used intensively for archaeological survey, more can probably be gained by high-resolution mapping of and modelling approaches to the physical and cultural landscape. Bourgeois, J. and Nenquin, J. 1996 'Les enclos circulaires, allongés et quadrangulaires en Flandre découverts par les fouilles et les prospections aériennes. Contribution à la connaissance des âges des métaux' in M. Groenen (ed) La Préhistoire au quotidien. Mélanges offerts à Pierre Bonenfant, Grenoble: J. Millon. 41-72. Bourgeois J., Meganck, M. and Semey, J. 2005 'Almost a century of aerial photography in Belgium: an overview' in J. Bourgeois and M. Meganck (eds) Aerial Photography and Archaeology 2003. A Century of Information. Papers presented during the Conference held at the Ghent University, December 10th-12th 2003, Gent: Academia Press. 37-48. Creemers, G., Meylemans, E., Paesen, J. and De Bie, M. 2011 'Laseraltimetrie en de kartering van Celtic Fields in de Belgische Kempen: mogelijkheden en toekomstperspectieven', Relicta 7, 11-36. De Bie, M. and Adriaenssens, S. 2009 'Digitaal Hoogtemodel' in H. Baeté, M. De Bie, M. Hermy and P. Van den Bremt (eds) Miradal. Erfgoed in Heverleebos en Meerdaalwoud, Leuven: Davidsfonds nv. 74-75. De Man, J., Cordemans, K., Verkeyn, J. and Mestdagh, H. 2005 'A laser based Digital Elevation Model. New possibilities for Flemish archaeologists' in J. Bourgeois and M. Meganck (eds) Aerial Photography and Archaeology 2003. A Century of Information. Papers presented during the Conference held at the Ghent University, December 10th-12th 2003, Gent: Academia Press. 151-61. Léva, C. 1990 Aerial Photography and Geophysical Prospection in Archaeology 2. Proceedings of the Second International Symposium Brussels 8-XI-1986, Brussels: CirA-ICL. Mertens, J. 1957 Les routes romaines de la Belgique, Archaeologica Belgica 33, Brussels. Meylemans, E. 2009 'Analyse van de morfologie en bewaringstoestand van een deel van het Romeinse aquaduct van Tongeren (prov. Limburg) met gebruik van het DHMV en erosiemodellering', Relicta. Archeologie, Monumenten- en Landschapsonderzoek in Vlaanderen 4, 81-98. Meylemans, E., Vanmontfort, B. and Van Rompaey, A. 2014. 'The evaluation of archaeological sites using Lidar and erosion/sedimentation modelling' in E. Meylemans, J. Poesen and I. In't Ven (eds) The Archaeology of Erosion, the Erosion of Archaeology. Proceedings of the Brussels Conference April 28-30 2008, Relicta Monografieën 9, Brussels. 23–36. Meylemans, E., Creemers, G., De Bie, M. and Paesen, J. 2015 'Revealing extensive protohistoric field systems through high resolution lidar data in the northern part of Belgium', Archäologisches Korrenspondenzblatt 45, 197-213. Stichelbaut, B. 2005 'Great War aerial photography, a contribution to the Flemish battlefield archaeology' in J. Bourgeois, and M. Meganck (eds) Aerial Photography and Archaeology 2003. A Century of Information. Papers presented during the Conference held at the Ghent University, December 10th-12th 2003, Gent: Academia Press. 137-50. Stichelbaut, B., Van Hollebeeke, Y. and Bourgeois, J. 2015 Archeologische inventarisatie aan de hand van luchtfotografische gegevens, Testregio Torhout (West-Vlaanderen), Rapport UGent, Gent. Van Daele, K., Meylemans, E. and De Meyer, M. 2004 'De Centrale Archeologische Inventaris: een databank van archeologische vindplaatsen' in E. Meylemans (ed) De Centrale Archeologische Inventaris: de opbouw van een archeologisch beleidsinstrument, CAI-rapporten, 1, Brussels. Van Impe, L. 1977 'Sporen van oude akkersystemen in de Limburgse Kempen' in Mandos, H. (ed) Brabantse oudheden: opgedragen aan Gerrit Beex bij zijn 65ste verjaardag , Eindhoven: Stichting Brabants Heem. 101–10. Vanmontfort, B., De Man, J., Van Rompaey, A., Langohr, R. and Clarys, B. 2006 'De evaluatie van bodemerosie op de neolithische site van Ottenburg/Grez-Doiceau' in K. Cousserier, E. Meylemans and I, In't Ven (eds) CAI-II: Thematisch inventarisatie- en evaluatieonderzoek, Brussels. 17-28. Vanmontfort, B., Van Gils, M., Paulissen, E., Bastiaens, J., De Bie, M. and Meirsman, E. 2010 'Human occupation of the late and early post-glacial environments in the Liereman landscape (Campine, Belgium)', Journal of Archaeology in the Low Countries 2(2), 31-51. Wiedeman, T., Antrop, M., Hageman, B., Vermeulen, F. and Stichelbaut B. 2005 'Ancient lines in the landscape. The use of GIS and aerial photography for the study of ancient roads and field systems in Flanders region' in J. Bourgeois, and M. Meganck (eds) Aerial Photography and Archaeology 2003. A Century of Information. Papers presented during the Conference held at the Ghent University, December 10th-12th 2003, Gent; Academia Press. 383-90. Wiseman, J.R. and El-Baz F. (eds) 2007 Remote Sensing in Archaeology, New York: Wiley.